Who likes free stuff? Everyone likes free stuff. And there we have content marketing in a nutshell. It’s not unfair to say that recruiting and staffing firms have been a bit slow on the content marketing uptake. Until recently it has been nothing more than an afterthought – a nice little marketing addition, for sure, but one that simply supplements a firm’s core efforts. But as agencies are quickly learning, content can help with engagement on both sides of the desk. Are your candidates and clients content? Why would a candidate or client choose you over another firm? The answer to this question rests on what happens in the empty (and all too often ignored) space between job openings. Engage the audience with content, building a reputation for expertise and trustworthiness. This makes it far more likely they’ll wander to your website when when it comes down to the crunch. But with content ambiguously defined by dictionary.com as ‘something that is to be expressed through some medium,’ it’s fair to say that many recruiters remain confused about exactly what good content looks like. So let’s take a look at what might constitute ‘good content’ at key points during both the candidate and client lifecycles, and get that empty space between job openings working for you. Speaking to the unique wants and needs of the individual – the aim of all good content – can be a difficult task when your audience are pre-hire candidates. Each candidate will find value in different content, so how do you find something that will please them all? Effective segmentation will allow you to deliver specific content to specific sections of your pre-hire candidate audience. Segmenting by things like employment status, industry category and experience will enable you to send emails with relevant jobs to the right people. But the best type of content for pre-hire candidates is that which pushes nothing more than guidance and goodwill. Career-oriented content can be extremely helpful, particularly for those currently employed but open for a new opportunity. And don’t underestimate the value of a newsletter, which allows you to aggregate this sort of content under your firm’s branding, and gives your candidates a helpful suite of material from which they can pick and choose the most relevant bits. Consultants aren’t quick-dry concrete – you don’t simply set and forget. They’ll likely become a candidate again one day, so it’s in your best interests to maintain the relationship during the placement. Thankfully, the content necessary to do so isn’t particularly taxing, can be automated and personalized. And just like that, you’ve delivered a relevant piece of content to your placed consultant. Do so on a regular basis – perhaps weekly, perhaps monthly, depending on the situation – and you’ll have shown the consultant that you take the relationship seriously. Consultant content should focus on providing both the tools that the individual needs to succeed in their role, and a communication channel for any support that they might need. Ideally the former will have been provided during onboarding, so the focus will be on the latter. Facilitating communication needn’t be complicated a simple ‘how are you?’ is succinct and effective. From candidates we move to clients. What does quality content marketing look like when directed at sales prospects? Clients, like candidates, are beautiful and unique snowflakes, each with their own set of needs and wants. As such, personalized email sequences that speak more directly to individual prospects should be developed. But the one thing that all sales prospects will have in common is their desire to know what it’s like to work with you. And this forms the main thrust of what sales prospect content should be. What are your firm’s USPs? Put them up in lights. What do your current clients like about how you operate? Form case studies that offer insight into what it’s like working with your firm. Learn about the prospect, and highlight why your firm would be a good fit. 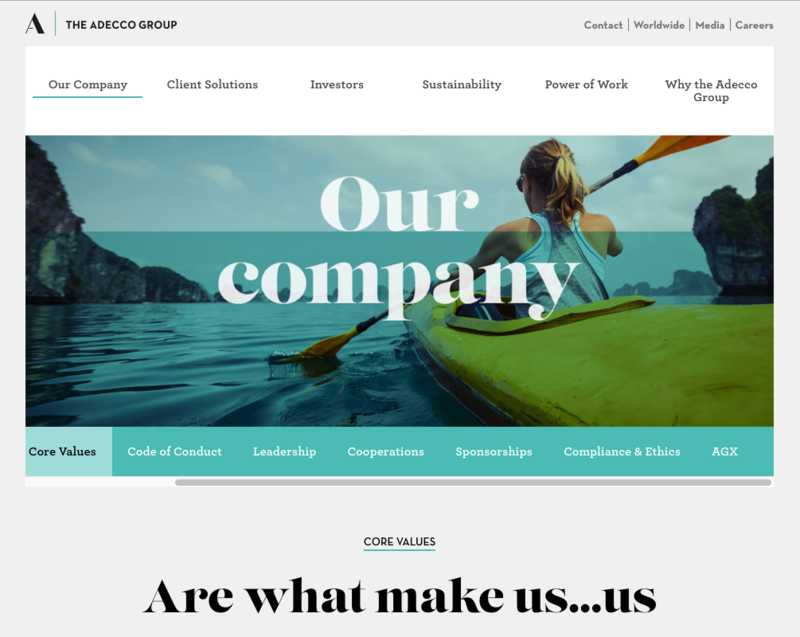 The Adecco Group does a great job outlining the core values of their family of brands. The ROI for content marketing to this audience is generally greater than any other, so it’s worth investing resources into making customized content that will really resonate with its recipient. So your sales prospect content worked like a charm and you’ve gained a new customer. The challenge now is to not let it slip out of your hands and back into the water. Don’t sweat it – content is your friend here too. Like consultant content, the focus for client content is less on providing material than it is facilitating communication. You want to know if something’s not working for your client before it becomes a serious issue, you want to know of changes in their circumstances, and you want to be able to offer them the right talent at the right time. Gaining this knowledge rest on retaining consistent, quality communication. So, as with your consultants, you’ll be checking in. While an email or text might suffice for consultants, it’s perhaps more appropriate to visit – or at least call – your ongoing clients. Using email to update them on news from your firm will help to keep you front of mind outside of this direct contact, however. Content. It’s a broad term, but in this particular context it might be best defined simply as being a good recruiter. It’s offering advice to those looking for work. It’s checking in with those who are already working. It’s demonstrating why you’re the best firm for the job. And it’s putting those words into action once a client is on board. Everyone likes free stuff, except perhaps those who are giving it away. But good firms know that they aren’t giving away content for free. They’re making an investment in their most important relationships – those with candidates, consultants, prospects and clients.